Few art historians would dispute that Jennifer Montagu is one of the most distinguished scholars of Italian (mostly Roman) Baroque sculpture. Besides her many articles and published lectures, her books include what is (and probably will remain for years to come) the most thorough study of a single sculptor, the monograph on Algardi and catalogue raisonné of his oeuvre (1985); the model edition of Le Brun's influent 'conférence' on the expression of passions, with an extensive analysis of Le Brun's ideas (1994), originally her PhD thesis; the Slade and Mellon lectures, respectively, Roman baroque sculpture: the industry of art (1989), and Gold, silver and bronze: metal sculpture of the Roman baroque (1995); a second book on Algardi for an exhibition in Rome curated by her, Algardi, l'altra faccia del barocco (1999); and Bronzes (1963), an irresistibly inviting introduction to a subject few people cared about at the time of its publication, small bronze sculptures, a topic which Jennifer Montagu would revisit often, with ever fresh, surprising, insights. A volume of essays in her honour is about to come out, as a tribute to her outstanding contribution to the history of art. She is currently writing a book on Giovanni Battista Maini, a sculptor who flourished in Rome during the first half of the eighteenth century. In her office on the second floor of the Warburg Institute, facing the trees of Gordon Square and filled with filing cabinets and stacks of documents and photographs, we talked not only about the issues Jennifer Montagu has worked on as an art historian, but also about several apparently trivial matters which deserve attention if one wants to get more than a glimpse of the person behind the voluminous scholarship: photography, friends, cigars, and the most brilliant operation of deception carried out by the British during World War II. That so many topics were discussed is testimony to Jennifer Montagu's immense generosity. João R. Figueiredo: You are known for disliking big theories and for rejecting the idea of having a method, which reminds me of something William Empson once said to I. A. Richards: "My pupils often ask me to explain about methodology, and I always tell them I have no idea what the word means." Would you say this describes your practice as an art historian? Has anyone ever tried to ascribe you a particular method? Jennifer Montagu: I completely agree. Some people seem obsessed by method, but I don't know what that means, and I certainly do not have one. I am interested in a variety of problems, and try to find a way for solving them: as the problems vary, so do the ways I try to find a solution. Some years ago some people from the Getty were interviewing everybody about their methods, and I have no method. I said it was utterly pointless to talk about method. Anyway, we agreed to discuss it over dinner, but it turned out that their recorder wasn't working, so although my name appears in the book they published, nothing that I said is in it. JM: Yes, some time in the Spring, I think. JRF: It's described by the publisher (Skira) as "a tribute to an art historian who fundamentally changed the way we think about baroque sculpture." What did art historians say about baroque sculpture when you started researching this subject? JM: I don't think I've changed anything. I mean, it has surprised me. I was always interested in how things were made. I don't mean manually, but studio organization and so forth, so I wrote about that. And I didn't think I was changing anything at all, I just thought I was dealing with certain questions that interested me and it seems they interest a lot of other people too. JRF: They interest other people now. JM: It seems so. There's that book by Wackernagel (Der Lebensraum des Künstlers in der florentinischen Renaissance, Leipzig, 1938), on Renaissance painting mainly, and he quoted always from published sources like Vasari and things like that about how artists actually set about working. Mine was more from documents. I didn't think I was doing anything, as I said, particularly original, or trying to change anything, I was just dealing with certain questions that interested me, such as "how does one set about getting a block of marble?" It so happens that at the same time—I didn't hear any of them—there were a series of Reith Lectures, you know, this series of lectures on the radio, by someone who was talking about genius, and so forth. I happen to find genius terribly uninteresting. The works they produce are marvellous, but you're never going to understand them because if you did they wouldn't be geniuses. (Laughs.) I was much more interested in how ordinary people worked, and in fact the geniuses also had to order blocks of marble in the same way, they had to cast their bronzes in the same way. JRF: Would you say it was not so much a change in "method", if the word can be used at all, that you introduced, rather a set of questions that were overlooked by art historians? JM: Quite, and relationships. For instance, so much of baroque sculpture was designed by architects. None of this was unknown. It's just that I happened to write about it while other people hadn't. JRF: What you offered your readers was an account of not just the finished sculpture but a whole chain of events and actions in which many individuals were involved. JM: Well, yes. This, to some extent, came out of my book on Algardi. A lot of this is actually in Algardi. It started there and I became interested in that sort of thing, and then I included other relevant material that I came across when I was working on that. JRF: And then you wrote Roman Baroque Sculpture: The Industry of Art, originally presented as a series of Slade Lectures at Cambridge. JM: Quite. It is a series of lectures intended for a non-specialist audience, and I think actually the book is quite readable partly because it started off as lectures that were meant to be listened to and, I hope, enjoyed. JRF: One of the ways you changed the perception of sculpture has to do with the actual way we look at statues and reliefs. You deal with it in your 2007 Frick Collection lecture. To a certain extent, you try to reconstruct the sculptor's intentions when faced with a particular location and the way he coped with the limitations of light, point of view and so forth. Could you elaborate a little on that? JM: I think it started again when I was working on Algardi and all the photographs one could get commercially of busts on memorials high up in churches—people had gone to tremendous efforts to erect scaffolding, so you got a whole lot of photographs of the tops of people's heads, whereas the artists knew they were going to be seen from the floor. So I insisted in having photographs taken specially for the book, from the floor and whenever possible with natural light, which is not always possible in churches. JRF: And you take your own photographs, don't you? JM: Well, yes, some of them... You should ask the Warburg photographer who had to try to produce reasonable images from them. (Laughs.) Yes, I do take a lot of my own photographs but not very many of them are publishable. But, very kindly, Oreste Ferrari, who was the head of the Gabinetto Fotografico in Rome at that time, gave me a photographer to take round and take these photographs for me of the main tombs in churches, and Oreste was actually very grateful to me because he said he had never thought of that problem before. JRF: In your analysis of Algardi's tomb of Pope Leo XI you combine both approaches: you discuss the view the ordinary visitor has from the floor but you also include a full-page detail of the head of the Pope, so as to show the sculptor's virtuosity. JM: Yes, quite. Certainly the artist was very interested not merely in what it would look like from below, but also how the head actually was, so a lot of details had to be taken from the straightforward angle. JRF: Algardi must have thought that some day the person who would have to dust the top of the statue might come to appreciate his beautiful carving. JM: Quite. And one does. Thanks to a restorer friend I've been able to look over all sorts of things close to. 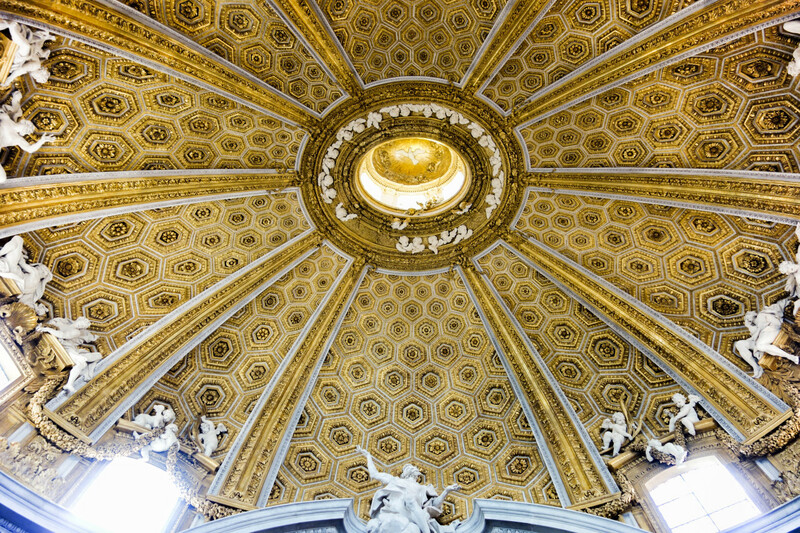 And the most fascinating recently was the Pietro Bernini Assumption of the Virgin in Santa Maria Maggiore, in what is now the baptistery, and looking at that close to, it's incredible what he did. JRF: And you published a photograph of the back of Bernini's tomb of Urban VIII, so as to show the inside of the statue with the marks of the bricks used for the cast. JM: Again, a friend let me climb up there. It was a rather horrifying experience because they started celebrating a Mass while we were up there. And at one point I was leaning forward and he dragged me back saying that someone might think the Pope was coming back to life again! (Laughs.) And we had to hide behind it until they finished it. (Laughs.) The same friend, actually, enabled me to climb up on to the top of the "baldacchino" in St. Peter's—I didn't actually get on to it—but right to the top level, but I froze. I'm afraid I didn't have the courage to take the one-foot step on to the "baldacchino" itself. JRF: Were you on scaffolding? JM: It was what the Italians call a castello, what the cleaners use. And I just couldn't take that one-foot step on to the "baldacchino". JM: Not vertigo, just plain ordinary fear. (Laughs.) My father had real vertigo. He would be on all fours up there. I was just terrified. But I do take the opportunity to go up to see sculpture close-to whenever I can, including once in a cherry-picker, but a cherry-picker is simple because it's somebody else's job to raise it. JRF: Some of your lectures and papers are peppered with witty remarks on the difficulties the Italian priests and nuns sometimes create for the art historian. Do you remember a particularly striking episode? JM: I can't think of anything all that particular. They can be very different. Some of them couldn't be kinder and more helpful. For example, at the Vallicella, the sacristan when I was working on Algardi, and later on Antonio Arrighi, was very helpful. And now when I ask to go into the chapel because I want to look at the statue, his successor says it has been photographed and published in books, you don't need to look at it. I didn't say it was my book it was published in. (Laughs.) The worst of all—I think they are no longer there as they've been thrown out—were a whole lot of nuns in Santo Spirito in Sassia who had set up a stall selling rosaries and what not on an altar. I'm not a Catholic, I'm not even a Christian, but even so, I was horrified. And just recently, the last talk I had to give I was talking about inscription tablets, and in the entry to what is now the museum in the Lateran the nuns have set a stall up just in front of the pedestal of a tomb, so you can't see it any more. They don't care about art from that point of view. Some of them are extremely unhelpful to visitors who want to get in, or get close to something. On the other hand, as I said, some of them couldn't be kinder and more helpful. JRF: Going back to photography, you were the curator of the Photographic Collection at the Warburg Institute for several years. What did your job consist of, exactly? JM: Well, it's exactly like being a librarian, helping people find the photographs they need and putting things back in order so they will be able to find them when they come. JRF: Did you make any changes to the classification system? JM: No, I made no changes at all. Well, everybody makes little minor changes. They made a lot more after my day, which was probably useful, because certain files get so large you have to divide them up, and so forth. JRF: Did you add many photographs to the collection? JM: Yes. Oh, yes. In my day, the library used to cut out the advertising sections from periodicals like The Burlington and Apollo and then we would chop those up and put them in. And then Christie's and Sotheby's were very kind about letting us have photographs. Then we had photographic campaigns of various sorts. When I came originally, we were photographing... er, well, it was the Illustrated Bartsch, but before Strauss did his publication we were sending these round to subscribing institutions, and then under me—I don't know why I got interested in it—we started off photographing medals, Italian medals post-Hill. You know Hill wrote this corpus of Renaissance medals (George Francis Hill, A corpus of Italian medals of the Renaissance before Cellini, London, 1930), but it was very difficult to find images of later medals, and so we photographed at the British Museum, the Victoria and Albert, the Hunterian, the Ashmolean and Cambridge—the main public collections. JRF: How much does your private photographic collection overlap with the Warburg's? JM: Actually very few of mine have I ever put into the Collection. Only if I could see any iconographical interest would I put them in, but otherwise I haven't. And actually, if I ever get around to making my will (which I've started every now and again and have always given up, and I must do) I'm leaving my personal photographs to the Hertziana. I would leave them to the Courtauld, but of course the Courtauld has killed off its photo collections. I'm interested in the artists. For the subjects, I just go downstairs. Mine are all under "artists". I have got quite a good collection of, obviously, Italian sculpture. JRF: I can imagine. Is it easy to keep it organized? JM: No. Just look at that! (Laughs and points to a desk covered with papers and photos). I come back with masses of photographs from Italy... The easy ones I put away, but then there are the ones that don't fit in any place very obviously... I go round museums in Germany and I take photographs of German things as well as Italian, and I really don't know where to put those. And then I never have time. JRF: You said somewhere you were always interested in sculpture, but you didn't want to go to the Courtauld and study art history there because it meant memorizing what other people had said and repeating it. What was the way out, then? JM: I came to the Warburg. At the Courtauld, I would have had to spend a year doing an undergraduate course that would allow you to do Art History and then go on to do an M.A. But the Warburg gave me two or three months of coaching with Gombrich, and then I could take a qualifying exam and start on my M.A. After three years of undergraduate work at Oxford (Politics, Philosophy and Economics) I was fed up with regurgitating what other people had written. I wanted to do research. I had already in fact written a very inadequate article, but I enjoyed doing it, my first experience in an archive. JRF: At the Warburg, who were the people who shaped your way of becoming an art historian? JM: Certainly Gombrich. Gombrich was my supervisor and my thesis was to some extent Gombrichian. JRF: On Le Brun's conférence on the expression of passions. JRF: Was he a difficult person? JM: No. Well, he could be. Never with me, actually, but he didn't suffer fools very gladly, particularly as he grew older. When he was young, when I first knew him, he was actually very helpful, but later on he became less tolerant. Ettlinger also made me look at all sorts of German things I would never have looked at otherwise. JRF: Did you meet Wittkower here? JM: Oh, I knew Wittkower here, yes. I didn't know him very well here. I had no particular reason. I was a little skivvy in the Photograph Collection and I would help him get his slides and so forth, but I wasn't working on sculpture in those days, so I never talked to him. It was only after he left, when I got working on baroque sculpture, when he came back, which he did every summer, I would sort of fall on him and ask him questions I wanted to discuss with him. JRF: What kind of person was he? JM: Oh, very kind, very helpful. He once said that if I gave him a couple of hours, he'd help me to understand architecture, which is something I simply do not understand; but I never had those two hours, so I still don't know about it. He was very helpful. Actually, it was his book Architectural Principles in the Age of Humanism which actually led me to the Warburg. Well, Gombrich did, but really I think that changed my way of looking at art history more than anything else, because before that, I had always thought that art history was a matter of attributing things, and then I realised there was a lot more to it than that and it was much more interesting than that. JRF: Anthony Blunt was not at the Warburg, but he was a friend of yours, and you acknowledge his help with your work on Le Brun. JM: Yes, yes. He was incredibly kind. He treated me as if I were his student. I only had to get on to his secretary and say "I would like to talk to him" and he would talk with me. Because Gombrich knew all about expression but he knew nothing about Le Brun, I really needed help on the French seventeenth century. I'm exaggerating, but when it came to actual details about seventeenth-century French art, I really needed Blunt, and so he gave me as much time as if I had been one of his students. JRF: We are used to believe that everything in art happens for purely aesthetic reasons, whatever that is, but you remind us there are many contingencies, like decorum, for instance, or an unpredictable array of practical matters that limit the artist's choice, which art historians are not always aware of (you wittily mention Virgilio Spada's concern about "incontinent dogs" who might stain too white a marble). As for decorum, I remember reading in your Algardi monograph some remarks about the putti Bernini designed for Sant'Andrea al Quirinale, who are playful and swing on the flower garlands. Decorum is tremendously relative, isn't it? Even within a limited space-time frame. Is it patronage alone that determines such variation? JM: Also, the church of Sant'Andrea al Quirinale is a very small one. In Sant'Ignazio, where Algardi designed the putti I was comparing with Bernini's, that would have been harder. But certainly there's a lot more than that, for instance the nature of the artist. I mean, Algardi didn't have the imagination Bernini had. It is a combination of temperament and decorum. Also patrons would accept everything Bernini did. He knew how far—to use that awful modern phrase—he could "push the envelope". JRF: You declare at the outset of Roman Baroque Sculpture that one of the tasks of the art historian is to "try and unravel just who did what". Why are you so keen on the individual artist? Does that relate to your mistrust of categories such as "style"? JM: Attributing things. What is by the artist and what is not. What interested me was the way people use the expression "workshop" without defining what it meant. Yes, I suppose I am interested in what the individual artist did and did not, what he left to others, and how he collaborated with other people, which you can only do up to a point in sculpture. Since I've been working on silver, you can't do it at all, but in sculpture one can say "this doesn't look like him", "this doesn't seem to reach his quality, and therefore it is not by him". Somebody else could have made the flower garlands, and you can make this kind of assumptions and, yes, I want to know how these things were put together. JRF: I ask this because in your books and essays it is very common to find an expression of regret for not knowing the name of who did this or who did that. JM: (Laughs.) Yes, I really want to know who did what, and I still go round Roman churches saying "who the hell did that"? I think it is basic art history. Unless you know who did it, you can't say very much about it. JRF: Because art is made by individual people, by human beings. JM: By human beings, exactly, and the more you know about them, the more hope you have of understanding what they are about, and where their sculptures fit into the history of art. JRF: I'm sure you know Algardi better than his contemporaries. JRF: Maybe even better than Algardi himself. JRF: Does the importance you give to the individual artist relate somehow to what I would call your preference for the underdog? JM: (Laughs.) I suppose I do like quite a lot of underdogs. I was always quite interested in finding someone one doesn't know much about and who has been overlooked. I'm rather attracted to complete nutters who don't seem to fit into anything and come from nowhere. Not that I know much about them, but people like Francesco Grassi, who was a Palermitan sculptor. He did some very odd things. I'd like to know more about him. (Brief silence.) Yeah, I quite like the underdog! (Laughs.) My dislike of the top dog in baroque sculpture doesn't come out of the fact that he was the top dog but he was just a very nasty person. JRF: That prompts me to ask you whether in your heart of hearts you really like Bernini. JM: Well, Anthony Blunt and I founded the Enemies of Bernini Society, as you know. I think Bernini was an absolutely loathsome person. But I do like his sculpture. He is a superb sculptor and a superb draughtsman. JRF: Even the late period? JM: Yes, the late period too. I'm convinced that he made the Saviour in Norfolk, Virginia (Chrysler Museum of Art), which is completely mad, and not the rather academic one in San Sebastiano, which now most people think is by him, but I can't believe this. The late sculptures are mad and hard to take, but interesting. JRF: Sometimes, the underdog wins, as was the case with Algardi. For instance, most early eighteenth-century Roman sculptors inherited Algardi's style (via Rusconi and Ferrata), not Bernini's. You deal with that in your Horst Gerson lecture of 2001, namely. Considering what you say in your Algardi book about his being more a modeler than a carver because, in Bologna, there was only clay as a material suitable for sculpture, would you agree that, ultimately, Algardi's posthumous victory was in part related to the geological character of the Bolognese region? JM: I wouldn't say that. Algardi, as a modeler, is important particularly because of his small sculptures. He is one of the few people who actually made small bronzes as such, and certainly one could trace that back to Bologna... or possibly his nature, or something else. He also did marble sculpture, which I don't think really shows any trace of that clay-modeling tradition, particularly if you compare the bozzetti which are in clay and are very different from the actual marbles that he carved. It was the marbles that interested Ferrata and influenced him, although he had a lot of Algardi's models too, and that went through to Rusconi and then through to Rusconi's pupils. None of them made small bronzes. (Brief silence.) Rusconi did, actually, but (laughs) that's another matter. So, I think it was the Algardi marbles that influenced the eighteenth century, and I don't think those do come out of what Algardi learned in Bologna. He changed style in a way when he got to Rome. JRF: So, the underdog won, somehow. JM: Yes, he did, thanks to this anti-Bernini movement. After Bernini's death, particularly in the eighteenth century, there was a backlash against the baroque, and the apparently more classicist Algardi was more easily tolerated, but then he lost again later. (Laughs.) The odd thing is that my Algardi book had a lot of good reviews and a very nasty review—it's the only one you ever remember, you never remember the good ones—but the bad one began with "This is a book that has been long awaited by the twenty people interested in Algardi", which is an exaggeration, but only just, in a way. Whenever I was asked by people what I was doing, I said "I'm writing a book on Algardi", and they asked "Who was he?" and I would have to say "well, he was a sculptor who was not Bernini". He certainly lost again, particularly reading something like Wittkower's Pelican History of Art volume (Art and Architecture in Italy, 1600-1750, 1st ed. 1958, 6th ed. 1999), which I think is a marvellous book in many ways, one finds that sculptors are always judged against Bernini, right through into the eighteenth century as well. JRF: Don't you find Wittkower's monograph on Bernini slightly disappointing? JM: Lavin, yes, and more. JRF: There's a portrait of you at the National Portrait Gallery. It's a colour photograph taken by Lucy Anne Dickens in 2000. Would you say it portrays you in a faithful manner? JM: Yes, I think it does. She was a daughter of Oliver Millar, incidentally, and she went round taking photographs of contemporary art historians, as a way of getting them all together, and she did so with each of us in our homes. JRF: It's a very theatrical photograph, isn't it? JRF: It reminds me of Guido Reni's Portrait of Cardinal Roberto Ubaldini (Los Angeles County Museum of Art). JM: (Laughs.) Well, I'm not wearing a red cardinal's outfit. I can't remember what I was wearing but it wasn't that. (Laughs.) But Ubaldini was quite an interesting person. JRF: Douglas Lewis, former Curator of Sculpture and Decorative Arts at the National Gallery of Art in Washington, wrote that you "applied an appropriately baroque personality to the task of reorganizing the study of seventeenth- and eighteenth-century sculpture". Do you consider yourself as having a baroque personality? JM: I have no idea of what the words "baroque personality" mean. (Laughs.) I think you have to ask Douglas what he meant by that. (Laughs.) If you are looking for things people wrote about me, have you ever read what Alvar González-Palacios wrote about me? (Persona e maschera: collezionisti, antiquari, storici dell'arte, Milan, 2014) It surprised me very much. I told him that it's actually like seeing a photograph of yourself instead of seeing yourself in a mirror and it's totally different and you don't realise you look like that. JRF: Going back to context and relationships, why do you think a sculptor like Monaldi, considered a minor artist by many, was so much appreciated by certain patrons? JM: He was very much favoured by Fonseca d'Évora. JRF: Indeed. Isn't it hard to understand? JM: Well, maybe they liked each other. One of the things I do believe in tremendously is what I call the "golf club". I remember someone becoming very surprised by a very classical artist becoming friends with a bambocciante, but there's always the possibility that both belong to the same "golf club". Artists went out shooting and hunting with all sorts of people, they could be neighbours or belong to the same confraternity or whatever, and so there were all sorts of reasons why people liked each other, patronized each other, or whatever it may be. JM: Contingency, quite. And also, in a way, back to Berenson, and the idea that artists can be studied just through their works, with no consideration of the circumstances in which people lived, without any contact with anything else outside the work. JRF: You began your 2012 lecture at the Metropolitan Museum on terracotta bozzetti and modelli by asking the audience to "think of MacDonald's", and went on saying "I'm sure the first thing that comes to your mind is hamburgers, despite the fact that we all know they produce a variety of other delicacies, some of them possibly even healthy." Was that original way of beginning a lecture on terracotta bozzetti and modelli inspired by Operation Mincemeat? JM: No, absolutely not. I rather like to start a lecture with something funny, so people relax and realise they can enjoy it. And I had thought of something like that and I actually couldn't think of what to say that immediately could make you think of something specific. It was actually Beverly Brown, who said "What about MacDonald's?" I hadn't thought of MacDonald's, I kept thinking of something like "Fortnum", and people would think of "Mason", but that wouldn't work in America, so she suggested that, and it has nothing to do with me. I'm afraid I have to say that all my best titles were given to me by other people, if I'm being honest. "The Industry of Art" is due to Neil MacGregor, and "The Influence of the Baroque on Classical Antiquity" to Marylin Parry. It was when we were talking about Titian being influenced by the antique, and when we checked the dates, we saw that the antique was discovered later than the Titian, and she said "That's the influence of Renaissance on Classical Antiquity", so I borrowed it, but I'm afraid it is not mine, actually. No, I was not thinking of Mincemeat. JRF: Operation Mincemeat was the most brilliant counter-espionage hoax put up during WWII, and your father, then Lt. Commander Ewen Montagu, was the mastermind of the whole thing. Was Mincemeat a topic of family talk after the secret was revealed? JM: Oh, yes. I don't know when he told my mother but he didn't tell me until just before The Man Who Never Was (1953) was published, or maybe a little before that, perhaps. It brought in a lot of money to begin with, for example. (Laughs.) When it was made into a film, it was great fun. When it opened in Holland, they had a practice of having films opening on successive nights in each city. My father was invited over, and my mother, and I went too. It happened to be the time of the great Rembrandt exhibition, which I wanted to see, and we had a marvellous time going around with these very entertaining film people. JRF: Do you know how Clifton Webb became to be chosen to play the role of your father? JM: No. I know there is one scene they had to do over and over again, because my mother suggested that my father, like Hitchcock, should appear in the film, and he appears in a meeting, as an air-force officer who says "You know, Montagu, if this is discovered, it will blow the whole thing", and every time he had to say it Clifton Webb would have giggles, and they kept redoing the shoot. The Man Who Never Was was also a very successful book. In fact, for some reason, the United States Navy did a reprint of it and I think they sell it to all these poor naval recruits, I can't think why naval recruits should know about this, but they do. Anyway, now every so often we get a quite substantial cheque. The U.S. Navy still sells this, although it has been published in various other forms. And there is this book by Ben MacIntyre (Operation Mincemeat: The True Spy Story That Changed the Course of Word War II, 2010), which I find a fascinating, beautiful book. He brought in a whole lot of new stuff my father didn't know about, or that my father couldn't say. JRF: There is a blatant narrative inconsistency in the film. The canister with Captain Martin's body is put inside the submarine before the four intelligence people go to the theatre in order to get the ticket stubs that should be used as wallet litter. JM: They had bought four seats next to each other, and tore off the relevant parts of the middle two. They were able to persuade the theatre that someone had done this as a joke, and were allowed in. But the film skips this explanation, hence the inconsistency. JRF: In the book, your father quotes a character from the Mikado, and says "What document could we provide which could be so impressive that would make the Germans alter their planning and disposition of forces? How could we provide a document with a sufficiently convincing background to make it accepted as genuine? For Pooh-Bah was right when he spoke of 'corroborative detail, intended to give artistic verisimilitude to an otherwise bald and unconvincing narrative'". What do you think of the similarities and differences between planning such a deception and some of the techniques used by artists? JRF: I was thinking of distortions or questions of point of view, perspective, and so forth. JM: Yes, quite. Well, I think there you would get someone like Bernini talking about someone who bleaches himself, including his hair, and the things you have to do when carving a white marble bust to counteract this effect. JRF: We find yet another association between art and war in the case of your maternal grandfather, the painter Solomon J. Solomon, as he was a pioneer in developing camouflage techniques that were eventually adopted by the military. JRF: Could you tell me a little more about your grandfather's groundbreaking inventions? JM: Not enough, I think. I know one totally implausible thing he did was to make empty trees that soldiers would stand inside and shoot from. And a lot of things which I find difficult to understand about how one disguises things that are going to be seen from above: buildings, and so forth. JRF: No, not at all. I had to prepare for this interview. For instance, I learned that your uncle, Ivor Montagu, was a film producer. JM: Yes, and a spy. He worked with Hitchcock, he worked with Eisenstein, and he was a soviet spy. He was a communist. What he had to give them I'm not quite sure. Do you know the story of the Ping-Pong balls? JRF: Didn't he establish the rules of Ping-Pong? JM: More or less. There's a book by Nicholas Griffin that was published recently called Ping-Pong Diplomacy about the use of Ping-Pong to open relationships with China, how the Americans used it. I found it rather interesting. The thing about the Ping-Pong balls is that Ivor had a correspondence with someone in Eastern Europe about how to get Ping-Pong balls during the war. His correspondence was being opened as they knew he was highly untrustworthy, and they couldn't believe this talk about Ping-Pong balls wasn't a code for something entirely different, but in fact it wasn't, it was about Ping-Pong balls. I once went to Russia and in those days the only way to get there was on a tour. I went to Leningrad and then spent a few days in Moscow, where I met a miserable trade unionist who had been left behind when his delegation went home, because he had had some heart problem. We met by chance, but we had this link through Ivor, so we ate dinner together while I was there. JRF: You lived in America when you were a child, during the war. Was it difficult to adapt? JM: Not really. I had my mother there, it was not as though I was sent to stay with total strangers, and it was only three years, from nine to twelve. Children adapt easily. JRF: Did you go to museums there? JRF: One of the pleasures of studying at the Warburg library on a summer afternoon is to have the windows open and suddenly be aware of the wonderful scent of your cigar coming from the courtyard. JRF: But it's delicious and not invasive in any conceivable way. You smoke Toscani, don't you? JRF: Is it a way of having Italy close to your heart? JM: No, it isn't. It's just that I moved up from cigarettes to Gauloises, to cigarillos, and then these are the ones I like best. They're the strongest you can get. The only place to go after that is heroin, and I don't want to go there. (Laughs.) Toscano "antico" is slightly stronger and I can smoke those. But I prefer the "extravecchio". I just ended up there. They taste of pure tobacco, and I actually prefer them to a Cuban. A Cuban is very nice, it's sophisticated, and a much better quality thing, but I actually like the tobacco taste of Toscani. I once went to give a lecture in Durham (North Carolina). The University in Durham is entirely funded by the Duke family who got their money from making cigarettes. It is a non-smoking campus, but there is a tobacco museum. The interesting thing is you go round this tobacco museum and there are some jingles they play from jukeboxes advertising cigarettes, but otherwise it is never really clear what they were growing this tobacco for. And there's a shop at the end, and I asked: "Do you have an ashtray?" and the person said (Jennifer Montagu whispers, as to imitate the seller's reply): "An ashtray? Oh, no, I don't think we've got any of those". (Laughs.) Do you know Pierre Rosenberg? JRF: Not personally, I'm afraid. JM: You know he always wears a red scarf. JM: Well, my cigars are rather like that. I was actually talking to a young art historian once and let out a cigar and: "Oh! you are the art historian who smokes cigars my teacher told me about!" So, I feel if I give up, nobody will know who I am. JRF: It's part of your iconography. Have you ever thought of writing a memoir? JM: Firstly, I have a very bad memory, a terrible memory. And I've had a very uninteresting life, really. Apart from what I've written, which may or may not be of any interest, nothing I've done has been of any interest. Also, I'm not good at characterising people. The number of people who have asked me "What was Blunt really like?"... I can't really say, because I'm not good at it. So, I don't think there would be any interest in it. JRF: I very much doubt so. Thank you very much. João R. Figueiredo is Assistant Professor in the Romance Literatures Department and the Program in Literary Theory at the University of Lisbon. Alessandro Algardi, Tomb of Leo XI, Vatican, St. Peter's. Pietro Bernini, Assumption of the Virgin, Rome, Santa Maria Maggiore. Gianlorenzo Bernini, Tomb of Pope Urban VIII, Vatican, St. Peter's. Gianlorenzo Bernini, "Baldacchino", Vatican, St. Peter's. Alessandro Algardi, St. Philip Neri, Rome, Santa Maria in Vallicella. Gianlorenzo Bernini, "Putti" in Sant'Andrea al Quirinale, Rome. Alessandro Algardi, "Putti" in Sant'Ignazio, Rome. Gianlorenzo Bernini, Bust of the Saviour, Norfolk, Virginia, Chrysler Museum of Art. Pietà, New York, The Frick Collection. Baptism of Christ, The Cleveland Museum of Art. Rest on the Flight into Egypt, Cambridge, Fitzwilliam Museum. St. Matthew, Rome, San Giovanni in Laterano. St. John, Rome, San Giovanni in Laterano. Tomb of Gregory XIII, Vatican, St. Peter's. Faith on the tomb of Cardinal Lelio Falconieri, Rome, San Giovanni dei Fiorentini. Bozzetto for the statue of Faith on the tomb of Cardinal Lelio Falconieri, Cambridge, Fitzwilliam Museum. Filippo della Valle, Temperance, Rome, San Giovanni in Laterano. Giovanni Battista Maini, Statue of Cardinal Neri Corsini, Rome, San Giovanni in Laterano. Filippo della Valle, Tomb of Innocent XII, Vatican, St. Peter's. Lucy Anne Dickens, Portrait of Jennifer Montagu, London, National Portrait Gallery. Guido Reni, Portrait of Cardinal Roberto Ubaldini, Los Angeles, Los Angeles County Museum of Art.